Anomalous origin of the left coronary artery from the pulmonary artery is a rare congenital condition that proves to be fatal in most individuals during childhood due to significant left ventricular ischaemia. However, there are case reports of individuals surviving into adulthood that have varying presenting symptoms. We report a case of a young male, who presented to our cardiology clinic with typical ischaemic cardiac pain, with no established risk factors, and was found to have anomalous origin of the left coronary artery from the pulmonary artery that was subsequently surgically corrected. Anomalous origin of the left coronary artery from the pulmonary artery is a rare congenital condition that often proves fatal in infants. However, we present a case of a young patient presenting with angina-like chest pains since childhood, who subsequently underwent successful surgical correction resulting in alleviation of symptoms. A 25-year-old normotensive, non-diabetic, non-smoker with no family history of ischaemic cardiac disease was referred to the cardiology clinic, by his general practitioner, for progressive exertional chest pains since childhood. Since the clinical scenario did not correlate with a low-risk cardiovascular profile, an exercise treadmill test was performed revealing non-specific ST changes within the anterior leads after nine minutes, with accompanying chest pain. A subsequent stress echocardiogram found a dilated left ventricle (LV) of 6.1 cm at end diastole, normal global systolic function at rest, with hypokinesia of mid and apical anterior wall during peak stress. 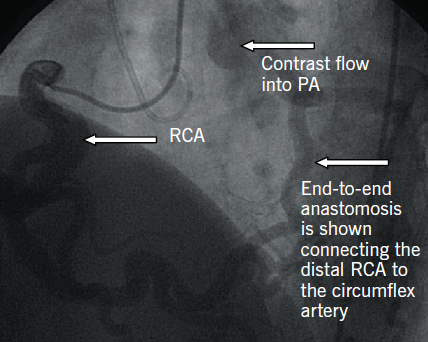 The evidence of reversible ischaemia led to a coronary angiogram being performed via right femoral artery, revealing a dominant large tortuous right coronary artery (RCA) and, via collaterals, to the left coronary artery (LCA) system, with subsequent retrograde flow into the pulmonary artery (figure 1). An aortogram demonstrated no appreciable LCA origin. This led to a coronary computed tomography (CT) being performed that confirmed the diagnosis of anomalous origin of the left coronary artery from the pulmonary artery (ALCAPA). The large tortuous RCA originated from the aortic root, with the LCA attached to the main pulmonary artery (MPA) (figure 2). A curved planar reformatted CT image confirms the origin of the LCA from the MPA (figure 3). Our patient was referred to and seen at the regional adult congenital heart disease centre. The patient, consequently, underwent a translocated ALCAPA repair with bovine patch and MPA reconstruction in May 2014. The operative findings noted a large dominant RCA with left main stem originating within the lateral aspect of main pulmonary artery 3–5 mm above the post-pulmonary cusp leaflet. The mitral valve was structurally normal. Mild LV systolic impairment with mitral valve insufficiency improved post-operatively. Post-operative recovery was uneventful, with no reported symptoms, and greatly improved exercise tolerance at subsequent outpatient follow-up. Coronary angiography alludes to the diagnosis, with the presence of a large tortuous RCA with collaterals filling the LCA system, as seen with our patient (figure 1). Non-invasive imaging modalities, such as cardiac CT and/or magnetic resonance imaging (MRI), allow visualisation of the origin of the LCA from the PA, dilated tortuous RCA and collateral arteries, with cardiac magnetic resonance (CMR) having the advantage of being able to assess myocardial viability and ischaemia.9 Figures 2 and 3 show CT images of our patient confirming the diagnosis of ALCAPA. Surgical correction is the treatment of choice in suitable patients and has been shown to improve chronic cardiac ischaemia, with encouraging post-operative long-term survival in infants undergoing surgical ALCAPA correction of 94.8%10 and 92%,11 with only a handful of case reports reporting survival after ALCAPA surgical repair in adults. On both three- and six-month follow-up, our patient reported no symptoms with greatly improved exercise tolerance. ALCAPA is a rare condition. A high index of suspicion is required. Coronary angiography may allude to the diagnosis, however, cardiac CT or MRI is a requisite for diagnostic confirmation. Surgical correction is the treatment of choice, with a frank discussion of risk and benefits being considered on an individual-patient basis. Long-term studies are limited but suggest good outcome. 4. Krause W. Uber den Ursprung einer akzessorischen A. coronaria aus der A. pulmonalis. Z Rat Med 1865;24:225–9. 5. Brooks HS. Two cases of an abnormal coronary artery of the heart arising from the pulmonary artery: with some remarks upon the effect of this anomaly in producing cirsoid dilatation of the vessels. J Anat Physiol 1885;20:26–9.